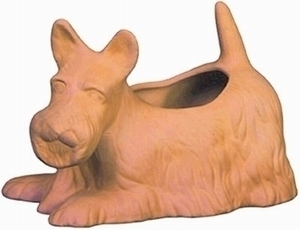 Terracotta clay flowerpot shaped like a scotty dog. Made of clay. Our adorable terracotta Scotty dog garden planter is a fun addition to any patio or garden area. With lots of details from the pointed tail to the perky ears, you can create a great display using colorful flowers, green houseplants or succulents. For any dog lover young or old, this flowerpot makes a perfect gift. When you choose to decorate the porch, patio or garden area you have so many choices to make. Don't forget the small tabletop planters that add so much charm and a personal touch to your outdoor decor. Our clay animal pots are the perfect solution. Just one small terracotta animal adds character and joy to everyone who sees it.